duende PR | Need some Karakter ? duendepr.com › news › Need some Karakter ? 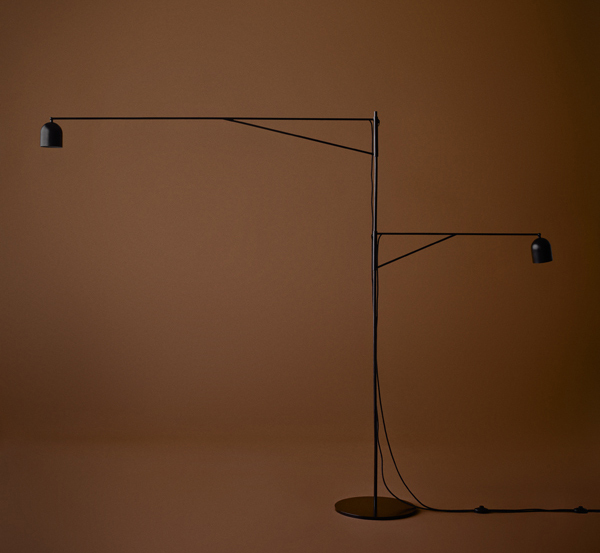 The Danish design brand Karakter just unveiled their first collection at Euroluce 2015. Karakter presented lamps and furniture from a wide range of talented and creative minds. From those who have already written the design history – to those who are striving to create the future. The driving forces behind the first collection are Joe Colombo (IT) and Aldo Bakker (NL). Two very distinct and unlike designers that still complement each other and help to establish that unique “je ne sais quoi” that is so important for Karakter. Where Joe Colombo represents the functional, affordable, democratic design – Aldo Bakker relishes on organic shapes, grandiose choice of materials and show pieces. Shared by both of them is an inspiring level of productivity and an uncompromising take on their work. Something that is also fundamental for Karakter and their choice of designs. CEO & Partner, Christian Elving, “The idea in itself should be uncompromising. Design should originate from a genuine desire to create or solve a problem – not a desire to sell.” Karakter presented ten pieces at Euroluce 2015. The collection contains lamps and furniture by Joe Colombo, Aldo Bakker, Andrea Kleinloog, PlueerSmitt, Milia Seyppel, Anatomy Design, Guillaume Delvigne and Laura Straßer. Sculptural. 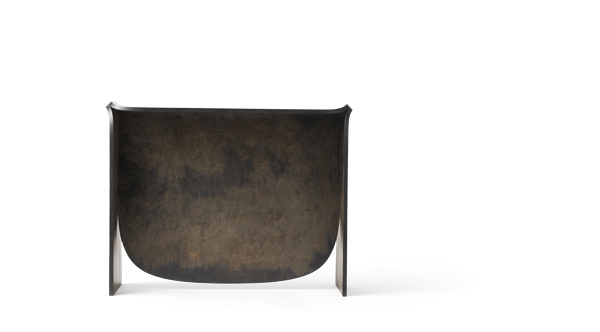 The Urushi Table is an archetypical table that is based on one line and refers to tree trunks. 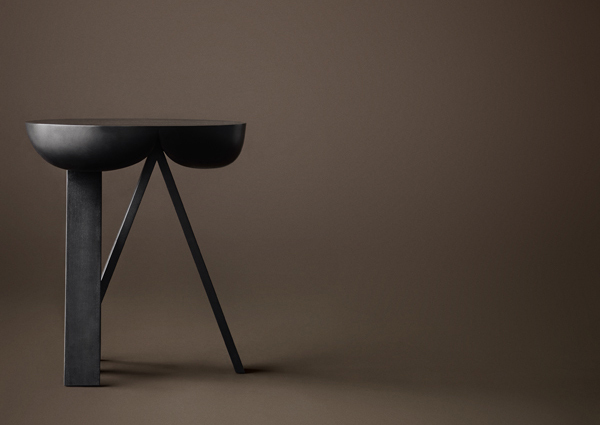 The legs of the table are an elongation of the line that is created by the tabletop. Because the tabletop and the base of the legs have the same width, they are of equal importance to the design. The deep olive color consolidates the earthly and solid character of the table. The table looks different from each side and the shapes will continuously change when you walk around it. The tapering legs are for example only visible from the front view. The legs can be moved with respect to the tabletop, due to which it is possible to create different outlines of the table. The Urushi Stool consists of two contradictive shapes that have been put together : an upright, vertical shape and a flat, horizontal shape. 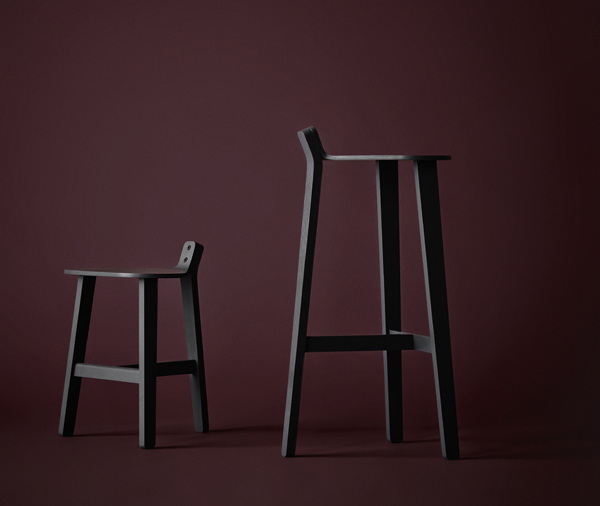 The vertical shape appoints the height of the stool whilst the horizontal shape designates the width of the stool and defines the seating. Because the horizontal shape is closed off by the seating, the Urushi Stool obtains its calm and self-reliant attitude. 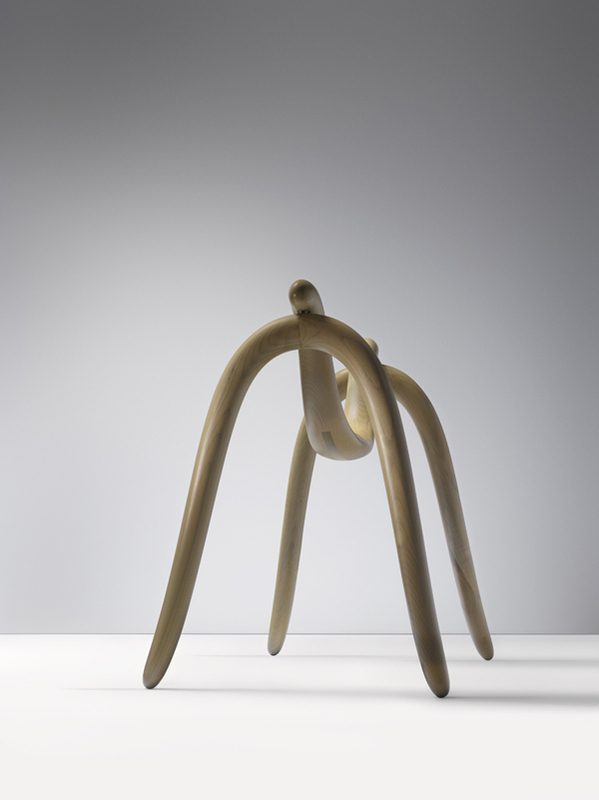 Saddle or stool ? Bronco Stool kick starts your thoughts. First the speculation about which way to sit: in classic mode or astride? 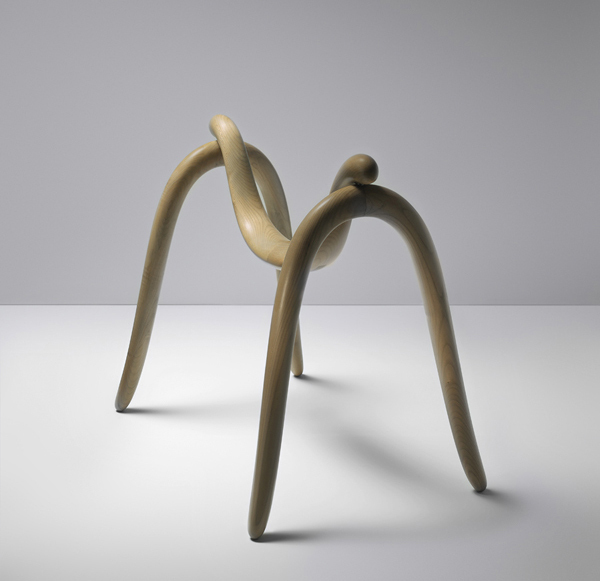 Then the two eye-catching screws and the moulded piece of wood that unites the seat and one of the legs. Is it a handle, a lower back support, a hook? Maybe all of the above. 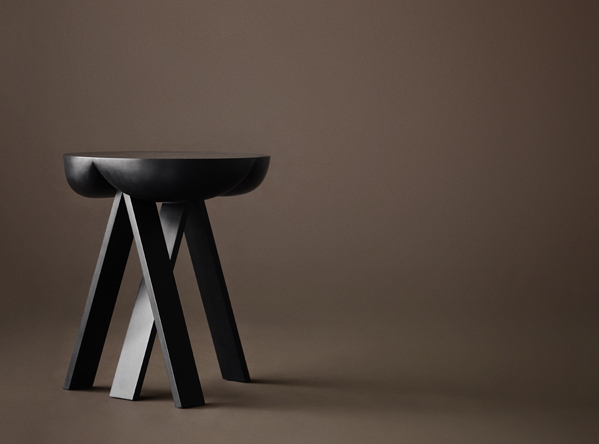 Through the fluidity of its form and its T-shaped structure, Guillaume Delvigne gave Bronco stool a robust, accessible and likeable identity. 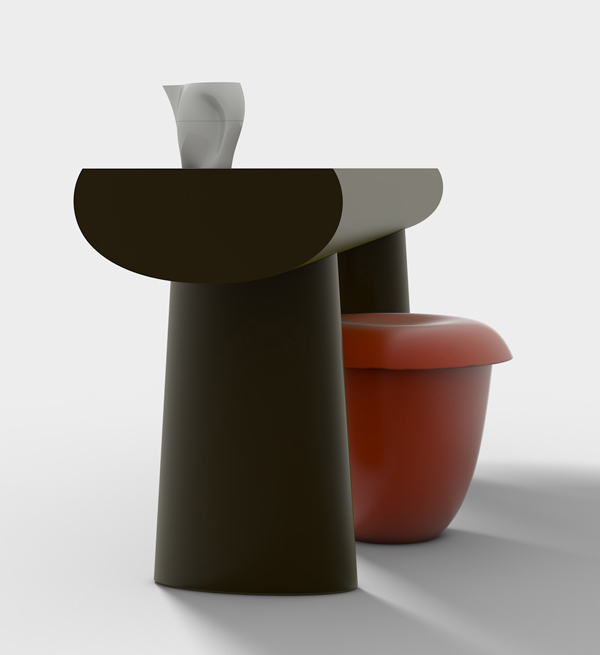 First produced by design company Super-ette, Bronco stool is now part of Karakter collection. The story continues for this new basic ! Well done. Symbiotic shapes. Bowl No1 consists of two shapes. On top, a ceramic dome with an added rectangular shape to give the dome a direction, and hint to its actual function as a lid. Underneath the lid is a small bowl that serves as storage place for treasures – or things you want covered. PlueerSmitt created an intriguing symbiosis where one shape becomes the other shapes handle. Minimal shapes. The minimal wood construction mimics the act of sitting down on a swing. It plays with familiar feelings of balance and gravity and seeks to bring out some of that carefree cheerfulness we may have lost along the way. One u-shaped piece of maple wood balances on two similar upturned pieces. Functionally abstract. Door Stopper from Swiss designers PlueerSmitt is an abstract shape with a well defined usage. The flat part is playfully shaped as if the weight of the door pressed it down, while the strong, robust vertical part can easily be pushed in place by foot. The natural untreated wood will gain patina from contact with its surroundings and users. Striking. Wooden side table consisting of two stripped-down trestles and a table top. The seemingly heavy top contrasts to the rigid trestles. The top gives in and provides space for the sharp ends of the trestles to lock the legs and the top together. 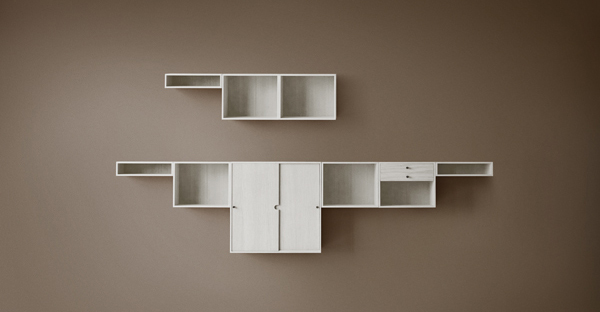 Intriguing shapes, familiar yet not at all, balancing between art and design. Viewed from different angels the side table varies greatly. A design meant to puzzle our understanding of shape, form and function. Industrial beauty. Inspired by industrial architecture, machinery, and tools for mass fabrication. Straight lines, sharp edges, clear shapes. Wrapped in a velvety soft surface reminiscent to concrete or stone. Different colour marks on the surface and irregular glazing on the inside makes each vase unique. 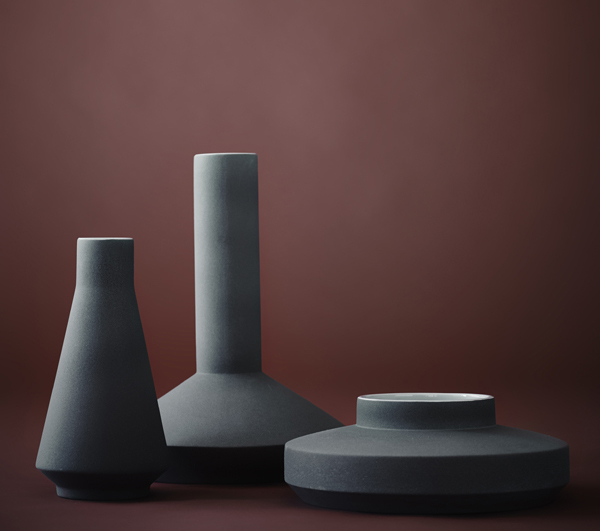 Thus VASES shrewdly reflects the clash between mass production and unique objects of art. 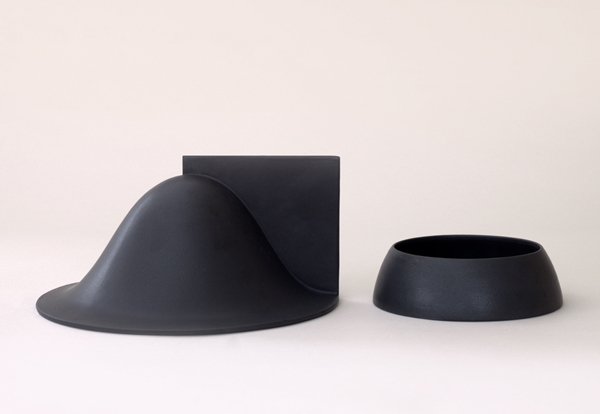 Milia Seyppel transforms rowdy industry into sensual ceramic objects. Three designs available, Vases 1, 2 or 3. A seating possibility. Walnut burl veneer, manipulated with copper sulfate – an alchemistic technique that augments the color of the wood – loading the well-known material with contrasting information. A seating possibility consisting of surface, lines and points.